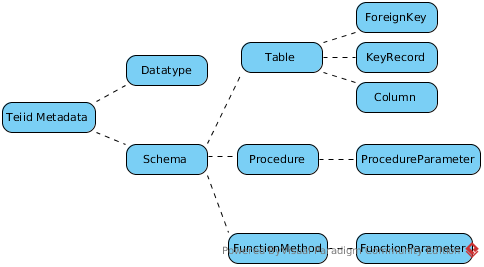 Schemas - The Schema contain tables, procedures, functions; the Table contain primary key, foreign key, unique key, columns, etc; The Procedure contain Procedure parameter; the Function contain function parameter. All ChainingMetadataRepository, NativeMetadataRepository, DirectQueryMetadataRepository, MetadataRepositoryWrapper, DDLMetadataRepository and MaterializationMetadataRepository are sub-class of MetadataRepository, more details refer to UML diagram. Before loading metadada, a MetadataFactory, ExecutionFactory(only for Source Model) and ConnectionFactory(only for Source Model) be created, passed as the parameters of ChainingMetadataRepository’s loadMetadata() method. Loading metadata, will load all source metadata(tables, columns, primary keys, index info, foreign keys) into MetadataFactory. After load metadata, MetadataFactory’s mergeInto (MetadataStore store) be invoked, MetadataFactory’s metadata be merged into a VDB scope MetadataStore. 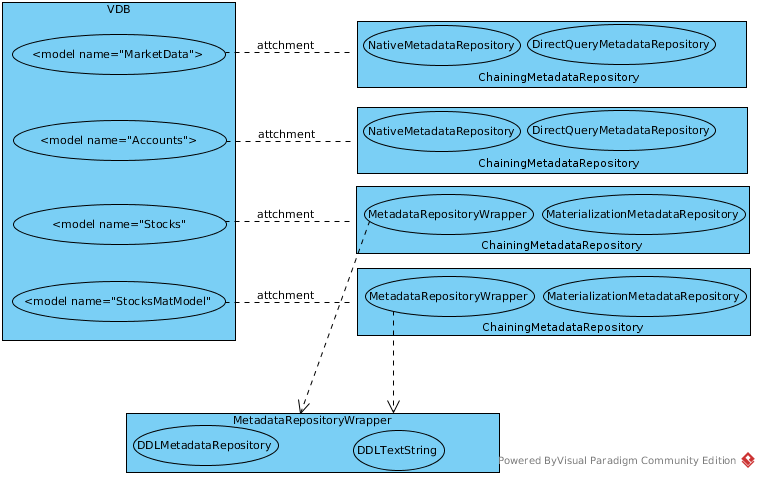 A MetadataFactory used in each Model’s Metadata loading, MetadataFactory can merge into a global VDB scope MetadataStore, which contains dataTypes, vdbResources, grants and a Schema, related with tables, procedures, functions. Note that, the result of Metadata loading load all metadata to a VDB scope MetadataStore, metadata in MetadataStore saved by Schema(each Model in VDB reference a Schema). Once the last Model’s Metadata loading finished, VDBRepository’s finishDeployment() will be invoked, relate below section for more. NOTE: TransformationMetadata base on VDB Scope Metadata MetadataStore, both TransformationMetadata and MetadataStore be added as VDB attachment. This section contain examples to quick understand the Teiid Metadata. Assuming customer.ddl file under classpath, which define a series of Metadata, this example demonstrates how to load metadata from a classpath file. Sample DDL Text File contain dll text, this example will demonstrate how MetadataFactory parse ddl text.